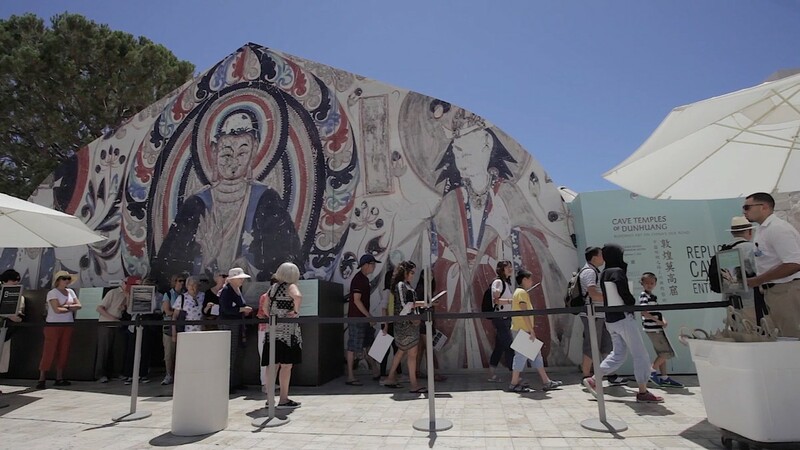 yU+co was honored to be commissioned to be the Media Content Producer for the Getty Center Exhibition Cave Temples of Dunhuang: Buddhist Art on China’s Silk Road, spotlighting the art, history and conservation of the Mogao Grottoes, a World Heritage Site near Dunhuang, China. 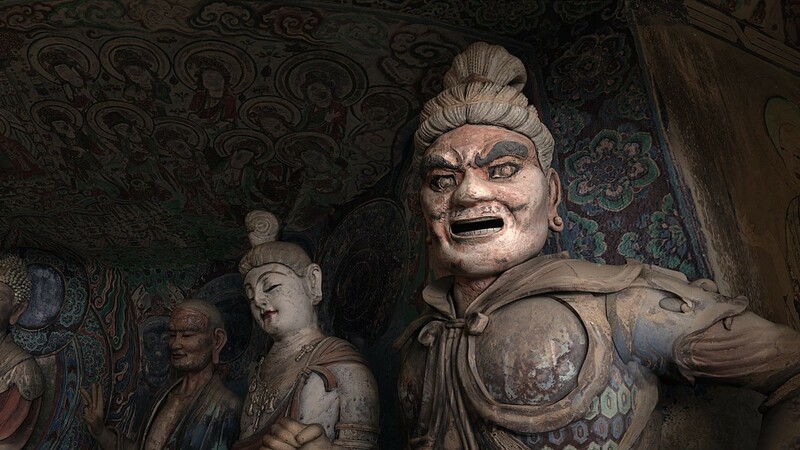 Dating from the 4th to 14th centuries, this Buddhist site of 492 cave temples excavated into a cliff face includes 45,000 square meters of wall paintings and over 2,200 sculptures - the largest, most magnificent body of Buddhist art in China. 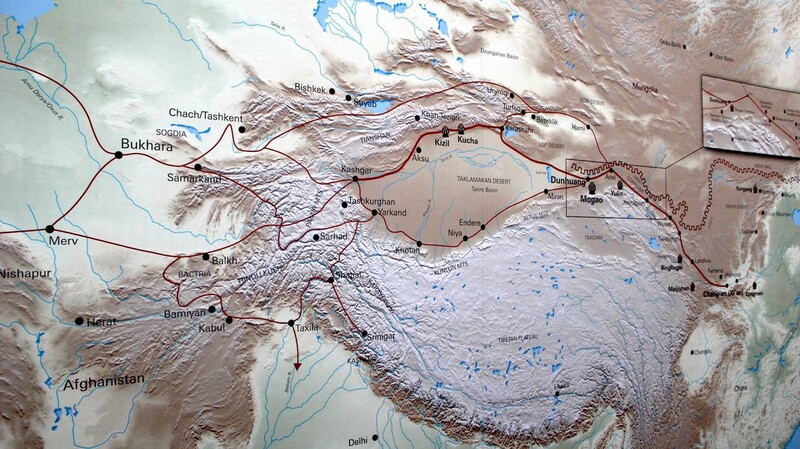 One of the exhibition’s challenges was to provide a physical sense of a remote place on the edge of the Gobi Desert, so various components were designed for this exhibition, each delivering a unique part of the visitor's learning experience. The Gallery portion of the exhibit provided overview of the location, the art, environmental threats and conservation efforts. 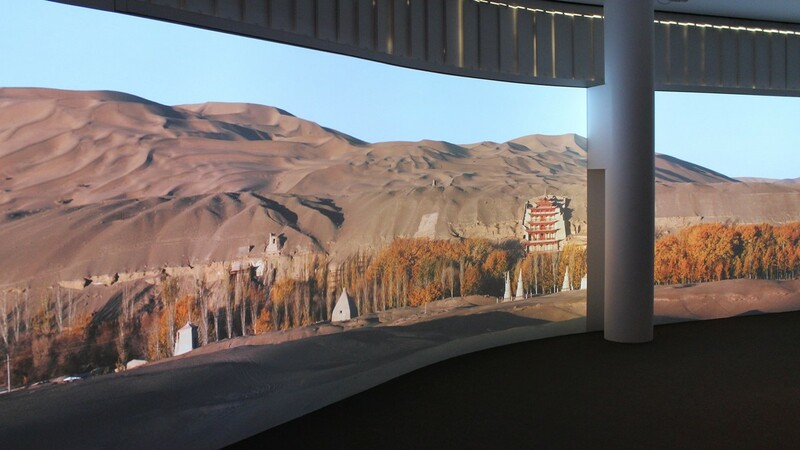 yU+co produced numerous videos, including a video spanning 3 screens, introducing visitors to the vast desert landscape. We also created six other animated videos illustrating the long-term threats to the art and caves and their preservation. yU+co produced the Virtual Immersive Experience of the exhibit, comprised of two parts. 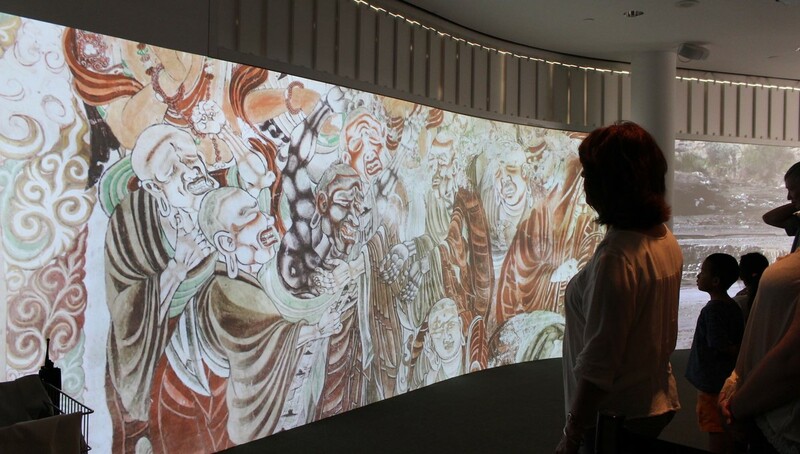 First inside the foyer, visitors were introduced to a series of panoramic images of the Mogao cave temples in their desert setting, accompanied by an original meditative score in 5.1 Surround Sound. The film was mapped onto a curved wall, which immersed the viewer. A major theme was how rain, humidity, floods and environmental factors have deteriorated the art. The highlight of the exhibit was the Virtual Immersive Experience of Cave 45, a finely decorated 8th century cave with a seven-figure sculpture group. Visitors were handed 3D glasses before entering the immersive screening room, which was dark upon entry with faint light illuminating the statues. The film was projected onto a 180° spherical screen spanning 30 feet, so the viewer could experience the convincing illusion of being surrounded by the space. This experience, which marks the first installation of its kind, was developed using Panoramic Stereoscopic technology, enhancing realism by adding depth to the environment. With resolution approximately 3600 x 1000 pixels, highly detailed stereoscopic renderings could be viewed up close and from different angles. The objective was to recreate the experience of a guided tour by using a flashlight to highlight the cave’s interior, as a sonorous voice narrated the meaning behind the sculptures and paintings. This was accompanied by 5.1 Surround Sound design with each sound element having symbolic meaning to the narrative, completing the immersive experience. 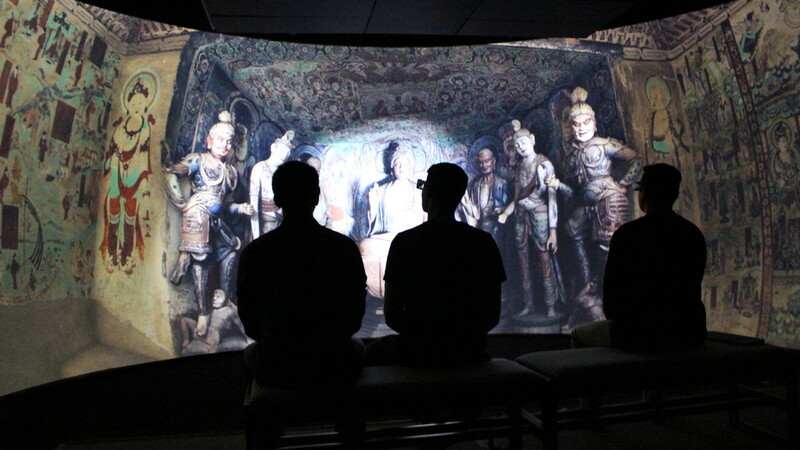 This exhibition represented a new way for museum visitors to peek into history using a comprehensive, multilayered experience, and marks the first time this patented 3D stereoscopic technology has ever been used by a museum. This may pave the way for museums around the world to incorporate this revolutionary new technology into future exhibitions. 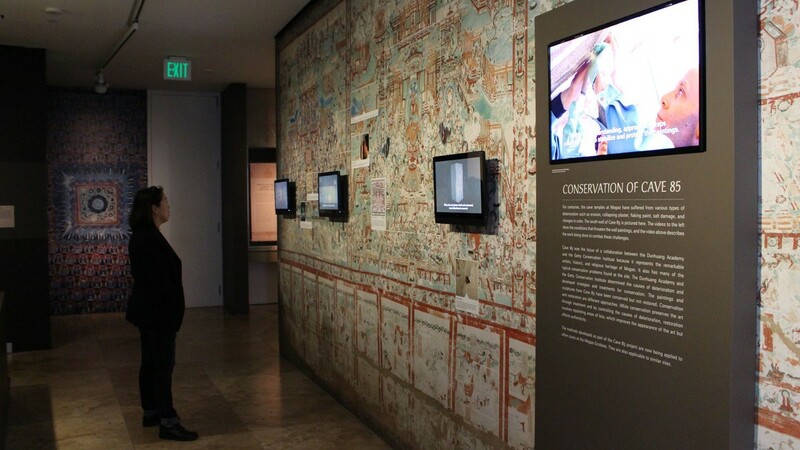 yU+co was the media producer for this Getty Center exhibition spotlighting the historical significance of the art and conservation of the Cave Temples of Dunhuang. The Gallery portion of the exhibit provided overview of the location, the art, environmental threats and conservation efforts. 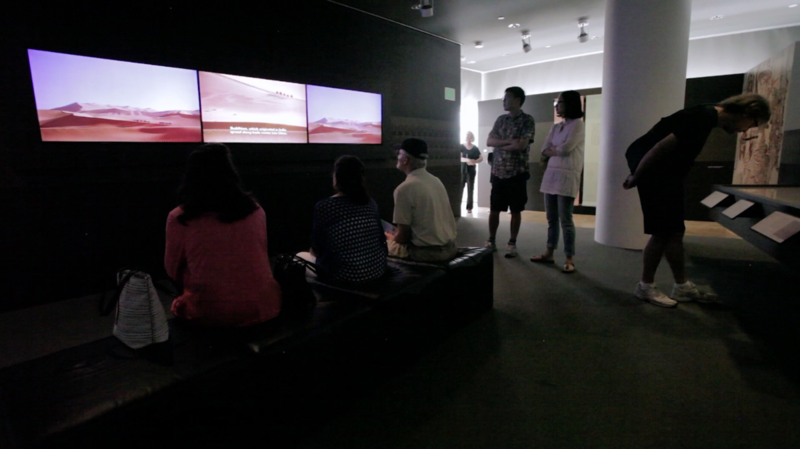 yU+co produced numerous videos, including a video spanning 3 screens, introducing visitors to the vast desert landscape. We also created six other animated videos illustrating the long-term threats to the art and caves and their preservation. yU+co produced the Virtual Immersive Experience of the exhibit, comprised of two parts: The Foyer and Cave 45. 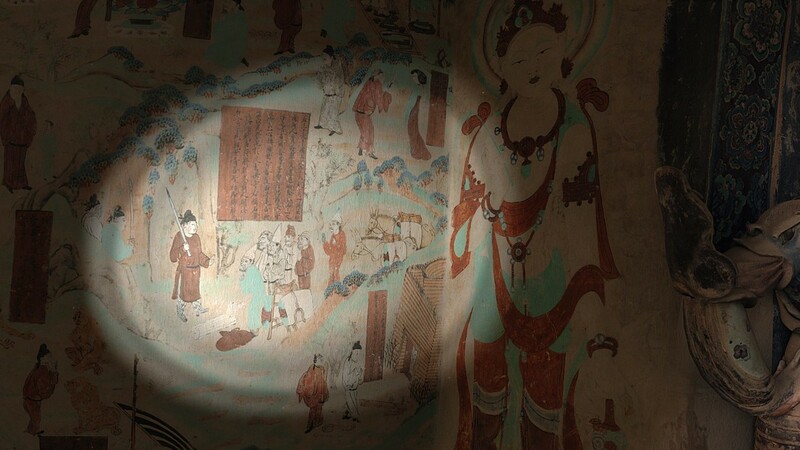 Inside the foyer, visitors were introduced to a series of panoramic images of the Mogao cave temples in their desert setting , accompanied by a meditative score in 5.1 Surround Sound. The film was mapped onto a curved wall, which immersed the viewer. A major theme was how rain, humidity, floods and environmental factors have deteriorated the art. 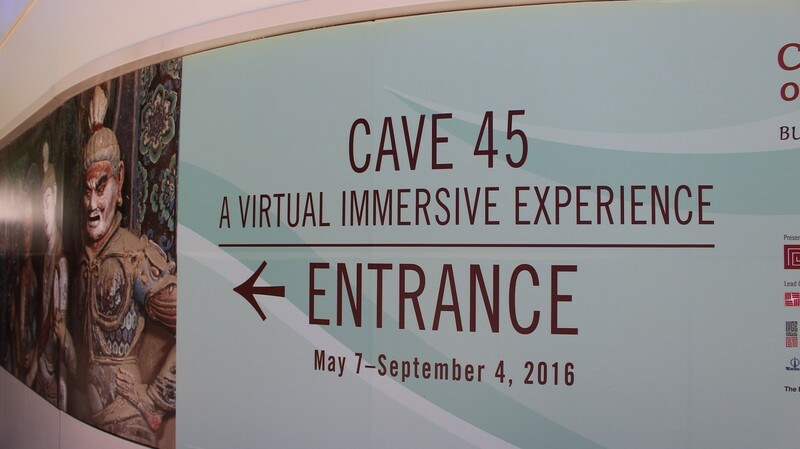 Upon entering the Cave 45 Experience, visitors were handed 3D glasses. The film was projected onto a 30-foot screen along a 180° curved screen, so the viewer could experience the convincing illusion of being surrounded by the space. With resolution approximately 3600 x 1000 pixels, highly detailed stereoscopic renderings could be viewed up close and from different angles. The objective was to recreate the experience of a guided tour by using a flashlight to highlight the cave’s interior, as a sonorous voice narrated the meaning behind the sculptures and paintings.